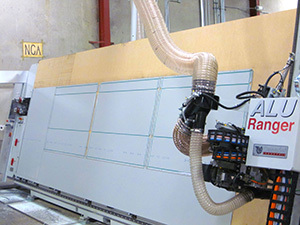 SAF Boosts West Coast Panel Production SAF – Southern Aluminum Finishing Co, Inc.
Atlanta, GA — April 3, 2014 — SAF (Southern Aluminum Finishing Co., Inc.) has increased its architectural panel-making capacity with a new CNC ALU Ranger 6321 VG Panel Router. The high-speed, high-accuracy CNC router is now operating at the company’s SAF-West plant in Redding, CA. The machine’s vertical 16’ 5” x 5’ 3” working area handles large ACM Panels, and can perform drilling, grooving, and cutting in a single setup. The automated CNC Router is used in the custom fabrication of SAF’s own lines of ACM and Aluminum Panel and Column Cover Systems, as well as custom fabricated panels. Panels produced by the router may be finished in the SAF West facility’s state-of-the-art anodizing line opened last year. Customers can order panels, columns, sheet, and panel-extrusions directly from SAF. SAF is an approved metal fabricator for major Aluminum Composite Panel (ACM) manufacturers. All SAF ACM and aluminum panels, aluminum extrusions, and aluminum sheet may be ordered with standard and custom architectural finishing options. For more information on SAF Southern Aluminum Finishing Co., Inc. panel offerings: http://www.saf.com/panels/. As a mill-direct aluminum buyer, an approved metal fabricator for the three major Aluminum Composite Panel (ACM) manufacturers, and a mill-direct buyer of aluminum coil, SAF is a contractor’s most dependable choice for any panel job. Based in Atlanta, Georgia since 1946, SAF (Southern Aluminum Finishing Co., Inc.) is a nation-wide aluminum distributor, metal fabricator, and aluminum finisher specializing in Kynar painting and architectural anodizing. SAF distributes, fabricates, anodizes and paints aluminum sheet, extrusion, column covers, architectural panels, and commercial roofing trim. SAF offers products and services to architectural specifiers, glazing contractors, and other industries. Services include aluminum batch anodizing, painting, coil anodizing, powder coating and architectural fabrication.